Bottled water is just one aspect of the global water issues Peter Gleick addresses as one of the experts featured in the new documentary Last Call at the Oasis from Participant Media, producers of the groundbreaking documentaries An Inconvenient Truth and Food, Inc. Read Participant Media’s interview with Dr. Gleick on the implications of bottled water here. 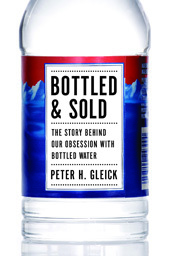 Pacific Institute President Peter Gleick’s new book, Bottled and Sold, shows how water went from being a free natural resource to one of the most successful commercial products of the last one hundred years—and why we are poorer for it. Every second of every day in the United States, a thousand people buy a plastic bottle of water, and every second of every day a thousand more throw one of those bottles away. That adds up to more than thirty billion bottles a year and tens of billions of dollars of sales. Are there legitimate reasons to buy all those bottles? Gleick investigates whether industry claims about the relative safety, convenience, and taste of bottled versus tap hold water. And he exposes the true reasons we’ve turned to the bottle, from fearmongering by business interests and our own vanity to the breakdown of public systems and global inequities. Peter Gleick was interviewed by George Stephanopoulos on ABC TV’s Good Morning America on June 30, in a great interview about his new book Bottled and Sold: The Story Behind Our Obsession with Bottled Water. You can watch it online (and find an excerpt from the book) here.